FamilyFitnessFilanthropyEtc: Family: A Place to Grow Is Right! Family: A Place to Grow Is Right! I, Eleanor Shriver Magee, distinctly remember the first day and night I spent at summer camp in Down East Maine in 1984, it is as if it happened just a few weeks ago. I slept in the top bunk, overlooking the lake and remember the thunderstorm that arrived early that first morning. It was quite a shock to be so close to the water during a thunderstorm. I think I hid under the covers out of fear. The seven-week session gave me the chance to make new friends, learn from new experiences, and most of all have tremendous fun. It can only be described as a life changing experience that now, this summer; I am excited to say, my son, Timothy experienced. 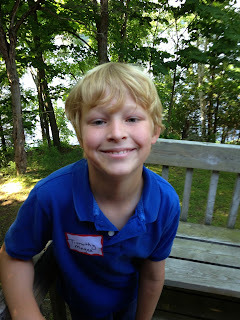 My years at camp were many and I started at 13, so for Timothy, on the Autism Spectrum, to "sign up" for a four week session of camp at age 10 in Canada, was pretty darn amazing. He was excited nearly every day leading up to the Drop Off Day. He would say, "I am going to CAMP KODIAK!" Only days prior, did I sense he might have some trepidation or anxiety. He asked me, how long is camp? I said, Timothy it will be like an extra long sleep over. That seemed to quell his fears and off we went to take him to camp. It was a long drive and as we reached the camp road, I remembered the first time I arrived at my camp, in a big tour bus full of other girls from all over the East Coast. Our time at Timothy's camp on that day was short, I knew for my own self-preservation, I needed to get in, check things out and get the heck out of there. Timothy handled it all with ease and was very matter of fact; he said simply, bye Mom and Dad! I on the other hand, was a hot mess on the way out the camp road. Thank goodness for Jack and his capable driving skills. I cried off and on for the next several days. During the four weeks Timothy was at camp, we received two email letters from him and two phone calls from staff. All the communications were positive and made us even gladder we had advocated for this journey for Timothy. He made new friends, learned new skills, ate new foods, and had fun! On Visiting Day, we walked up toward the camp and waited to have any visual of Timothy. All of the sudden out came this blonde, taller, and skinnier young boy from the crowd, it was our son, the camper! He ran toward us and we shared a group hug like no other. It was truly the best day! We got to see Timothy play chess, dance and sing in Suessical the Musical, yes in four weeks the camp puts together two cast shows of a musical where all 250 campers have a role, we ate a delicious lunch, and we got to meet his new friends, William, his bunk mate and Hudson, among others. Plus we got to meet all his counselors, a dedicated and patient bunch of young people whom we have great appreciation for taking such good care of Timothy. If you are a parent and you are trying to think of a productive way for your child or children to spend all or part of their summer, consider overnight summer camp. I realize it is an expense, but I think the costs are mitigated by the gains in intellectual, spiritual and emotional growth. Whether you send them for a week or seven weeks, it builds confidence, character and creates friendships and memories to last a lifetime. My camp experience sure did! Summer camp is a place to grow for sure! The photos below are from Drop Off Day (blue shirt) and Visiting Day (black shirt).